Leatherworking has been around for as long as man has been eating meat. It’s an old craft with lots of tradition and terminology. 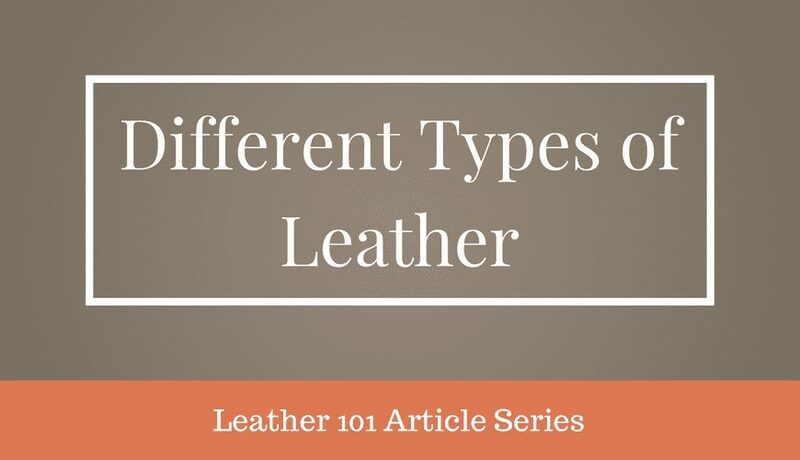 This makes learning about the leather craft a whole lot of fun, but it can also make it confusing for consumers. When buying leather products, you want to make sure you know what you’re paying for. This often means wading through the marketing and learning some of the common terminology when it comes to different types of leather. A cow, if you’ve never happened to see one, is a pretty big animal, so it has thick skin, and a lot of it. A whole cowhide is quite thick, and generally too thick to be useful for everyday leather products. So it’s usually cut down to be thinner and more useful for different purposes. (You can learn more about this from our last Leather 101 topic: Measuring the Thickness of Leather). Cowhide is made of two main integrated layers – the corium and the grain. 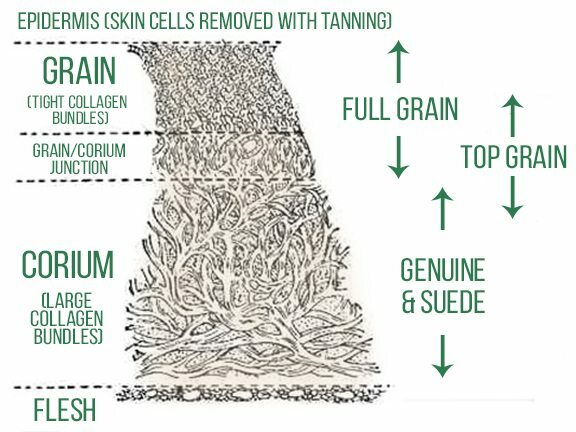 Collagen fibers in the corium are thinner and more flexible, and become tighter and thicker as they move up toward the grain, where the fibers are tightly packed and very sturdy. The corium becomes thicker with age, which is why calfskins are thinner, smoother and softer than the hides of older animals. The top part of the grain faces outward toward the hair, and can contain blemishes like insect bites, stretch marks, scars, and brands. This means that the very top part of the grain is often buffed off to make the leather look more uniform. When the leather is corrected in any way, it is called top grain. Leather with the entire grain intact is called full grain. Full grain leather, even though it may have blemishes, is more expensive and more sought-after than top grain leather because of its durability and longevity. Both full grain and top grain leathers are referred to as grain leather. Among grain leathers there are three general categories: aniline, semi-aniline, and protected. Analine leathers (like Horween’s Chromexcel) are processed using soluble dyes to maintain their natural markings and texture, and do not have a surface pigment or coating. This makes them the most natural-looking leathers, but also more susceptible to scratching, fading and staining. Semi-analine leathers (like most bridle leathers) are treated with pigments and thus conceal more blemishes and have a more uniform coating, as well as staying more protected. Protected leathers have a non-leather coating sprayed or attached to the leather as a protectant. The bottom part of the leather, the part that is split off from the grain at the grain/corium junction, goes by many different names, and it can get really, really confusing. 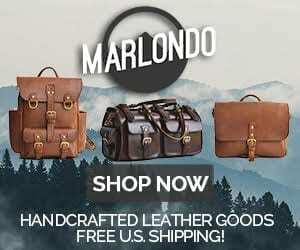 Many people refer to this bottom layer of leather as “genuine leather”, however, the term isn’t used consistently and is also used to mean real leather as opposed to manmade faux leathers. 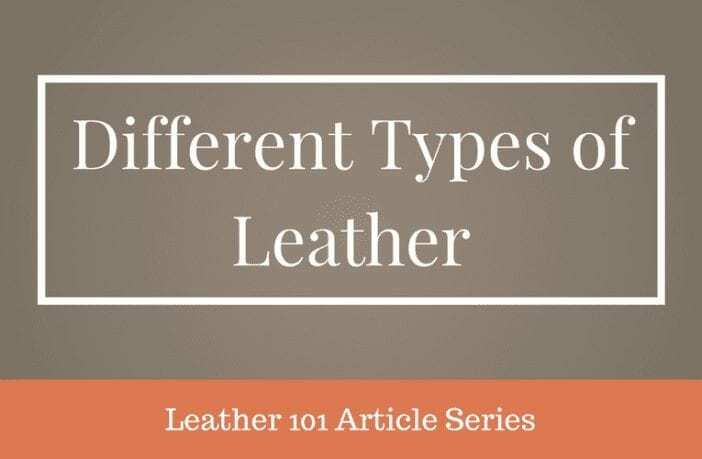 More terms you may see: split leather, corrected leather, embossed leather, coated leather, Suede, Napa leather (again, not a consistently used term), painted leather, and more. For our purposes, we’re going to refer to it as split leather. Split leather can then be sliced down even thinner and used for other purposes. Often a polymer coating is applied and embossed to mimic a grain leather; however these leathers are not nearly as strong or durable. This is sometimes referred to as a finished split. Another use for split leather is suede, which has been textured to have a napped finish. Suede is often confused with nubuck, which is a grain leather that is textured to have a similar nap finish. The difference is that nubuck is much stronger and more durable than suede, though suede’s softness and pliability make it useful for certain applications. Bonded leather is the lowest grade of leather, because it is not really leather – just shredded leather scraps and bits reconstituted with a filler and backed with an embossed polyurethane coating. It’s very cheap, but falls apart quickly. Bonded leather is found in low-end furniture and accessories, and sometimes book binding. You may also see this referred to as reconstituted or blended leather. There are several ways to spot a grain leather mimic, where split or bonded leather is embossed to look like more durable grain leather. If the leather in question has a very uniform or monotonous pattern, it may be evidence of embossing. Artificial leather also doesn’t have a pullup effect, which is a slight color variation when grain leather is bent or folded. Painted or polyurethane layers are non porous and thus do not effectively absorb leather conditioners. Again, a word of warning to consumers: many of these terms are not used consistently, and you can get confused easily. The most common mistake I’ve run into is the use of the term “genuine leather”. Genuine leather is most frequently used to describe low quality split leather, but to be honest, it’s a dumb word, because many people (including myself) have made the very easy mistake of assuming that the word “genuine” means the opposite of “fake.” So I’ve seen lots of leather shops use the term “genuine” in their product descriptions, in an attempt to convey the fact that they are not using faux leather. But that term just ends up scaring people off, even if they have a solid product made with decent leather. Go out there with your newfound knowledge, but be aware that sneaky marketing terms, old-fashioned lingo, and honest mix-ups can make things difficult. So don’t be afraid to ask questions!